Awake comes as a nice surprise after the disastrous fiasco that was Smile. L'arc~en~ciel has been known to experiment and change styles. They started off with pure visual kei and noir-styled music in early albums Dune and Heavenly. In Ark and Ray, they came alive with their super-charged J rock pop style. After many successful albums, they changed their musical style once more with the mature hard rock of Real. Then the band broke up, and the members went onto solo careers. Then they came back to produce Smile, which I found horrifying to the extreme. While the production was sound, the music contained on the album was bland, with a boring punk focus. I was very disappointed. However, my interest in L'arc~en~ciel has built up once again with their latest album, Awake. I have listened to it, over and over, since purchasing the album. Let me tell you why you need to pick this up right now. Awake marks another change of pace for the popular band. Some of the songs in this album fall into what I call 'genki rock band' music, seriously happy and heavy music, such as the opening song "Another World." It's not exactly the kind of music that you would get from Noir-like Laruku, but it's catchy and it definitely makes my day. This trend follows into "Jiyuu he no Shoutai," which features spectacular drums that move the song in a positive direction. These two songs are simple, groovy and very likable! But that's not all of what makes Awake a great album. The band returns to its roots with old-school pieces, such as "My Dear" and "Lost Heaven." "Existence," "Trust" and "Orphelia" contain tones akin to Ark, with a sublime merge of J rock and pop. "Orphelia" is one of my favorite songs on the album, with an acoustic guitar accompaniment and complex arrangements. There are even some heavy pieces on Awake, such as "As One" for those that like hard music. 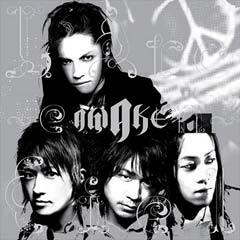 An L'arc~en~ciel album would not be complete without its stunning ballads, and Awake is no different. While I find "Jojoushi" to be a tad over-dramatic (although the pace is enjoyable), "Hoshizora" is definitely memorable. It opens up superbly with Ken's guitar, and then piles layers onto itself into an amalgamation of all things Laruku. There is a sense of fulfillment in this song, which sounds like a mix between Hyde's solo singles and funnily enough, "The Silver Shining" from Ray; it’s a must-hear song. The album ends on Ken's merry note, with his "Twinkle Twinkle" being a light rock song that speaks of many more interesting songs to come from the group. As for production values, it could not have been better. Although Hyde's voice has certainly become lower and roughened, he still has an absurd range that contains all of the attitude that we know him by. Ken's guitar solos are less flamboyant, tending to be shorter and more in the background of songs. However, they still have his definite style, albeit a more matured one. Tetsu is still a genius on his bass guitar. His riffs are amazing, holding the songs together with his funk and sometimes punk rhythm. As for Yukihiro, the drumming patterns are no less engaging as before. He is the core of the band, and it shows in his superb skill. This is a great album because of all of the potential it has within. There are hints of the future to come and a homage to previous Laruku works. I consider Awake to be a definite album for them because of its success in bringing all of the members of the band together and creating a sound that is certainly true to the band. If you are a fan, this is a necessary purchase. If you are not, pick it up and become a fan. I can't see any reason to hold you back.